Few things say summer better than fresh, juicy, brightly-colored citrus fruits. Thus, a summertime wedding captures the essence of the season with zesty-inspired table decorations. It begins with viewing the table setting as one big arrangement, with all of its elements centered on the theme. The table cloth serves as the backdrop, the place settings and table centerpiece serve as the main attractions, and the decorative accents serve as bonus pieces. 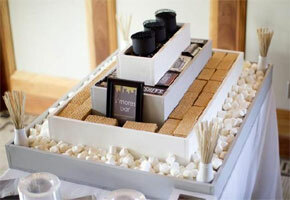 See our own ideas for planning an inspiring event! This color scheme clearly includes bright, cheery orange, yellow, and green. Clearly, this theme means applying the natural hues of oranges, lemons, and limes. Thus, peach, a subdued variant of orange, is selected as the dominant color to be used as the backdrop for the entire table setting. Lemon yellow is chosen as the middle dominant hue, appearing in the floral arrangements, the napkins, and other selected elements. Finally, orange and green complete the palette as accent colors appearing in touches throughout the table. The overall effect? A beaming summery look that will surely have guests smiling back. Some decor items may come in more subdued shades in chartreuse and light orange. Staying within the same color family, introduce different tints and shades for visual interest. For example, the chartreuse and light orange colors of a sachet subtly echo the surrounding elements in orange and green, including the peach background provided by the tablecloth. Ivory, being neutral, can be used as a complement to all the colors in the palette (see photo below). The ivory-colored fabric blooms in these miniature flower pots, for example, help offset the bold oranges and yellows, lending a softer, creamier appearance to the entire display. The casual arrangement of gerbera daisies and orchids in a glass bowl plays up the party’s lighthearted ambiance. To create varying heights in the table display, tall rectangular glass vases may be substituted for the glass bowl. Or a group of freestanding slender vases, each holding a single flower, can be arranged in a circle in the center of the table, with the colors positioned in an alternating fashion. Beyond the traditional floral centerpiece, why not incorporate real, fresh fruits in the display? Aside from their colors and textures, actual fruits add character and authenticity to the table arrangement. Colorful fruits add character and authenticity to the display. Displayed in any of these ways, the light, tangy scents of these fruits provide a refreshing aroma for guests to experience. Choose lemon yellow as the base color, with orange and green completing the look as accent colors. For a color with both a green and yellow hue, chartreuse also make an elegant addition. 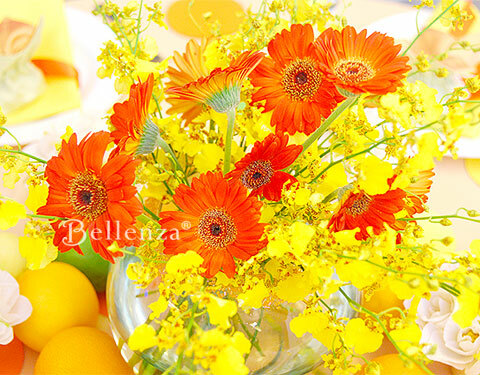 The effect is a summery look for a jubilant table display. Create centerpieces with flowers in citrus hues such as gerbera daisies, oncidium orchids, roses, liliums, carnations, and poppies. Incorporate actual fruits into the table display, artfully arranging them in special groupings. Craft table decorations with whimsical cutouts colored in yellow, orange, and chartreuse. Serve sweet things that entice the senses such as sorbets. Inject some spontaneity into the decor by applying creative accents that are easy and fun to make. For example, vari-colored paper cutouts can serve as inexpensive embellishments to the peach tablecloth, giving it more texture. Their circular shape and festive hues are an obvious reference to citrus fruits, yet their graphic-design look lends an edgier feel to the more traditional decorative elements. As an alternative to these cutouts, use confetti, swirly ribbons, and crinkle paper. For a playfully sweet touch, serve lemon drops, orange slice candies, or citrus-flavored hard candies in little porcelain dishes around the table. Citrus doesn’t always have to mean tangy and sour. Using sweets and desserts adds a bright and sweet flavor to the scene. For a festive dessert offering, serve up refreshing sorbets in chic martini glasses, soda drinks in orange, lemon, and lime flavors, and for something a bit more sophisticated, lemonade infused with limoncello liqueur or citrus vodka. As an alternative to one big wedding cake, a grand display of frosted cupcakes in summery colors and flavors such as lemon fits in perfectly at a carefree summer wedding celebration. 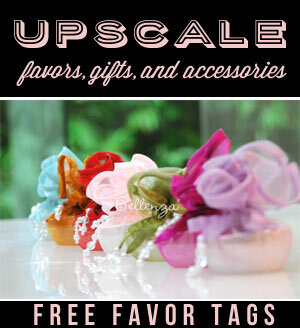 Sachets hung on the backrest of each chair are pretty favor containers for summery treats. Olive green and burnt orange can also add a lovely effect on the tables. Take-home treats can also be presented in keepsake boxes elegantly wrapped in olive green and burnt orange wrapping tissue. As both these colors are sophisticated derivatives of the basic green and orange of the event’s palette, they lend an elegant touch to the setting while still blending nicely with the surrounding colors. Next A Romantic Tuscan Wedding Tablescape: Inspired by Wine! 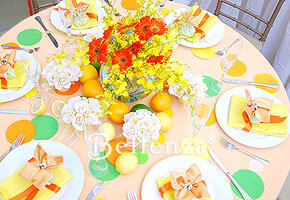 A citrus theme is also great for a bridal shower theme. 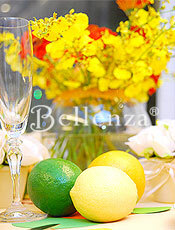 You don’t really have to spend a lot on decorations plus using citrus fruits are so attractive and colorful. Anyone have ideas for a cake that has a citrus theme? 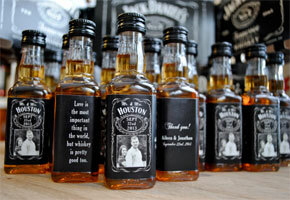 I’m getting married next year (summer 09) and would like to incorporate this idea. I recently noticed you’ve been publishing some interesting decorating content. and I found your site in the nick of time. Hi, I’m getting married Feb 2012 and I’m looking into having sky blue, fuchsia pink, and lime green or yellow as our wedding colors. Do you think it would be a good color combination? We want a vibrant travel themed wedding since its basically what our love story is about. Any suggestions for the flowers and the wedding decors as well. I have a few in mind already but it would be good to hear some more ideas. Thank you so much. Hello, Jam — I’m presuming from your color choices that February won’t still be winter time where you are. The palette you mentioned sounds almost spring-like. If you really plan to have all 3 colors (sky blue, fuchsia pink, lime green or yellow), the key is to work with a base color, and use the others as accents. So your base color for the ceremony could be ivory or ecru, with the bridesmaids dresses in just 1 of your chosen colors with multi-colored bouquets. Then, at the reception, you could choose another of your colors for the table linens, with again multi-colored centerpieces. Hope this helps!